Adrian has asked all fans to participate, if they possibly can. 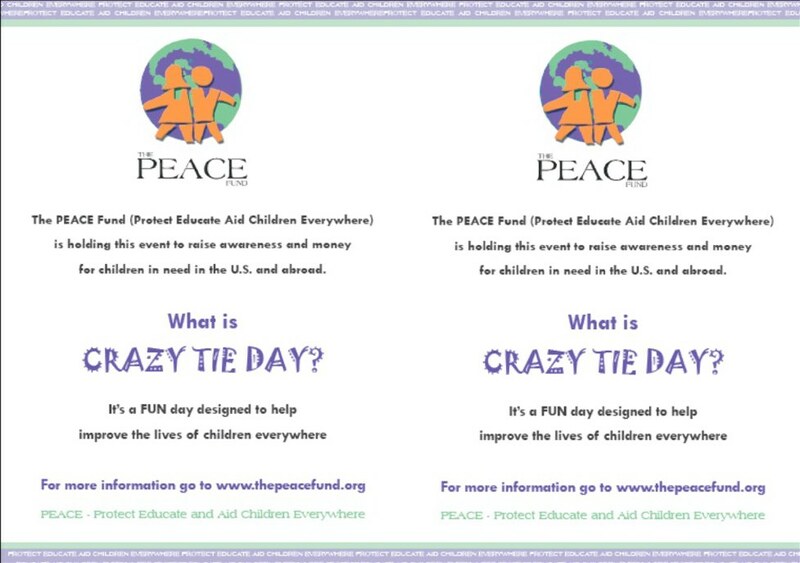 As many of you know: on October 19th The PEACE Fund is hosting our very first Annual Fund Raising Event -The Crazy Tie Day. That's about a week away. Although we know that raising money is a hard thing to accomplish, we are certain with the amount of support that The PEACE Fund has garnered, we will be able to make this event a success. But... this is not solely about raising funds. It's also about raising awareness for PEACE and the children we support. We need to get this event out to as many people as possible who might not even know anything about The PEACE Fund, and this is where I need your help. We have created a flyer (see below) to spread the word, and we need to get it out there NOW! So if you have the time, please print it out and hand it to local businesses/or friends. If they can't take part, then ask them to hand it to someone who they think might be interested. I know many of you, like myself, have very busy days so the other option is to email the flyer to all your friends and get them to help. For instance, I actually have a few of my local restaurants that are going to put them alongside their menus so that people can take them home or read them before they start their meal. In a short time you can help me reach a lot of people around the world. So I hope you can join us to make our first Annual Fundraiser a great success. PS. Highlander the Source is nearly finished. So here is how it works!! Almost like a Charity Walk/Run event...you have people agree to sponsor you. 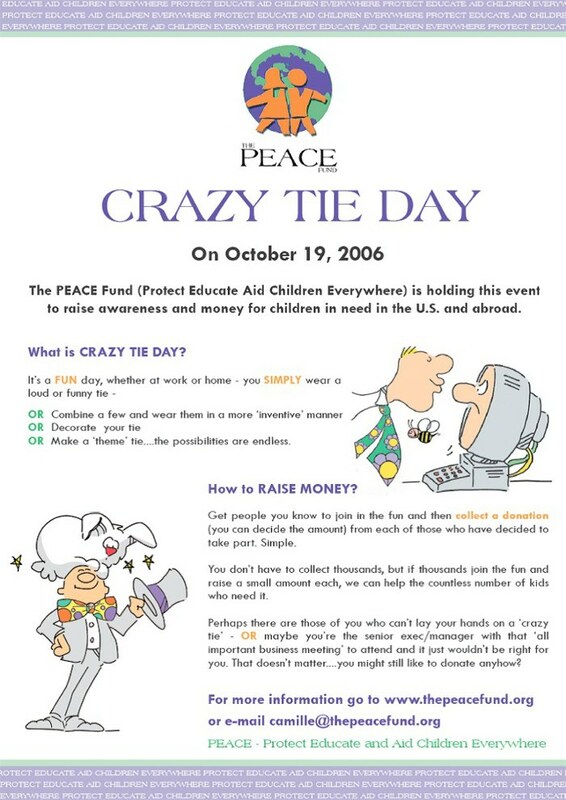 They make a pledge for a dollar ($$) amount if you wear a crazy tie to work/wherever on October 19th. So...sign them up, then head for a thrift store (or your closet) and find a crazy tie to wear. Then go collect those pledges and send them off to PEACE! Take them to a local copy shop, or print out on your own computer! To Download: Right click on picture. whatever you decide on, do it on your own computer. or the Adrian's Angels Yahoo e-group files.